quantitative or qualitative value of risk related to a concrete situation and a recognized threat. Methods for assessment of risk may differ between industries and whether it pertains to general financial decisions or environmental, ecological, or public health risk assessment. Over the past decade, CCM has developed an industry risk alert model based on five aspects: Policy, Operation, Demand, Export and Competitor. It is a precaution model with a scoring system supported by CCM’s profession AL analysis & suggestion. 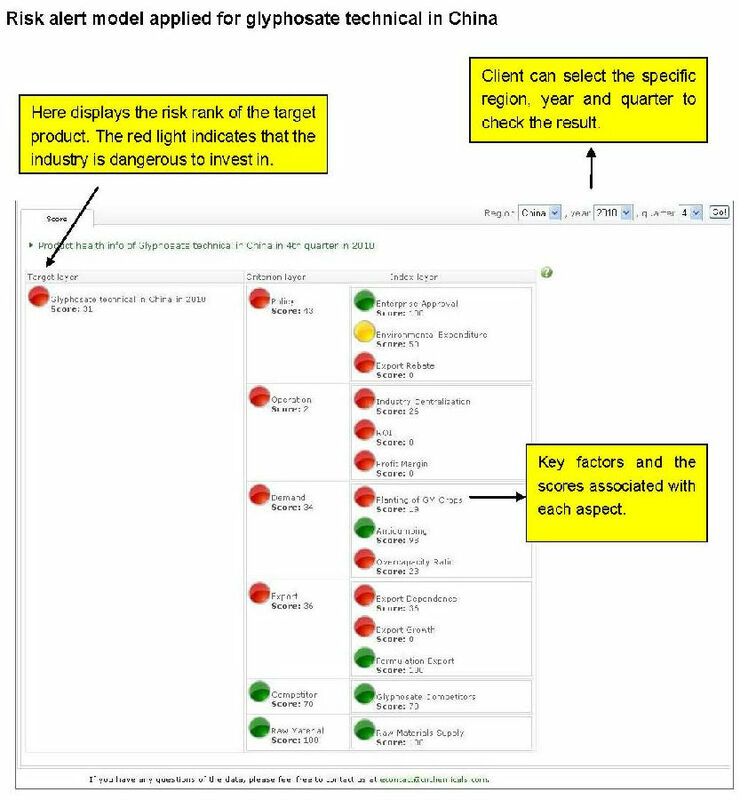 The model can alert clients to avoid the industry risk. Industry risk alert model designed by CCM is a precaution model with scoring system supported by professional analysis & suggestion. Through the result computed by the model, clients can recognize risks in the industry. CCM’s market monitoring tracks current and expected future trends in different industries’ markets. We provide a synopsis of the latest market situation, outlook and other market drivers, focusing on agricultural products, chemical products, food, pharmaceutical products and many other industries’ products. Our market monitoring aims at improving market transparency and detecting emerging conditions that might warrant the attention of decision makers. Wehelp clients identify opportunities and avoid unnecessary risks. The straight-forward logic of our excellent analysis models and the helpful charts in our report, give our clients easy command of current market circumstances. CCM periodically tracks a variety of indexes, which are calculated by reference to a theoretical collection of assets, market indicators, securities, or derivatives, whose absolute level or periodic difference related to the performance of the theoretical collection over that period. Currently, CCM primarily monitors the changes in production, price and consumption processes of the respective industry.